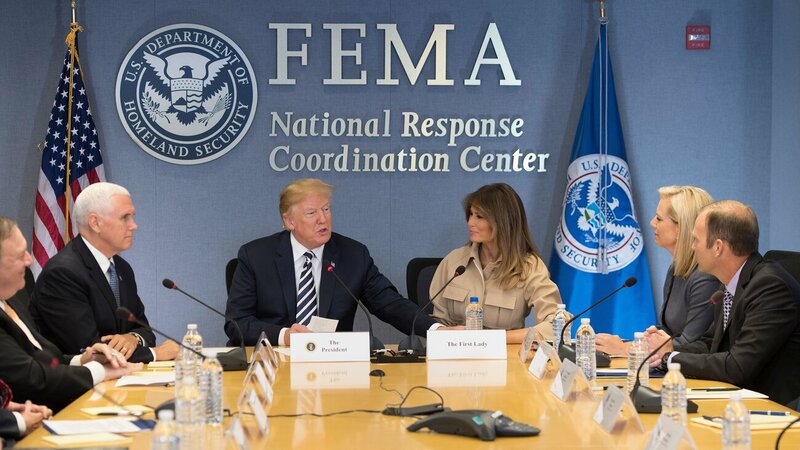 Trump Administration Transferred $9.8 Million From FEMA To ICE | "Global Possibilities"
President Trump, Vice President Pence and first lady Melania Trump visit the Federal Emergency Management Agency headquarters in Washington, D.C., on June 6. Secretary of Homeland Security Kirstjen Nielsen and FEMA Administrator Brock Long are seated at right. This summer, DHS transferred nearly $10 million from FEMA to immigration authorities, according to a congressional document. This summer, the Trump administration transferred nearly $10 million away from the agency that responds to disasters and emergencies, redirecting it toward one of President Trump’s top priorities — the deportation of undocumented residents of the U.S. The funds transfer is prompting the Federal Emergency Management Agency to cut back on training, IT security and infrastructure investments, according to a document sent to Congress and released by Democratic Sen. Jeff Merkley, D-Ore.
Merkley calls the transfer “reprehensible,” and immigration advocates say it highlights an alarming shift in priorities, but the White House is adamant that the redistribution of funds will have no harmful effect on the response to Hurricane Florence. In a briefing Wednesday, a FEMA response and recovery official told reporters the agency has “plenty of resources” to respond to to the storm, currently approaching the Carolinas and Georgia. The transfer of funds to Immigration and Customs Enforcement “has not impacted our situation whatsoever,” said Jeff Byard, the associate administrator of an arm of FEMA. The fund transfer was revealed in a June 30th document obtained by Merkley, a vocal critic of Trump’s immigration policies who helped draw attention to the separation of families at the border. His office has shared the file with NPR. The Department of Homeland Security, which includes both FEMA and ICE, told Congress that ICE needed an extra $200 million to cover the costs of detaining and deporting more migrants than the agency had expected. To cover the shortfall, DHS “reprogrammed” its financial resources, which is permitted under budget rules. Among other things, it redirected $9.75 million from FEMA’s regional operations, response and recovery, mitigation, mission support and law enforcement training budgets. Merkley, who is a member of the Senate Appropriations Committee but does not sit on the Homeland Security subcommittee, nevertheless acquired a copy of the document describing the transfer and released it on Tuesday. He appeared on MSNBC to discuss the transfer. Because of the loss of the $9.75 million, FEMA “will curtail training, travel, public engagement sessions, IT security support and infrastructure maintenance,” DHS writes. FEMA receives more than $16 billion in funding each year, about twice the funding earmarked for ICE. The transfer was approved by the Republican chairs of the House and Senate Homeland Security appropriations subcommittees, but not by the rest of the subcommittees’ members. Democratic Sen. Patrick Leahy of Vermont, the vice chairman of the Senate Appropriations Committee and a member of the Homeland Security subcommittee, sent a statement to NPR denouncing the “hefty price” of Trump’s immigration policies. The Department of Homeland Security has forcefully resisted any suggestion that disaster readiness has been affected by the fund transfer. DHS spokesman Tyler Houlton called Merkley’s announcement “a sorry attempt to push a false agenda,” without denying the authenticity of the document. Under no circumstances was any disaster relief funding transferred from @fema to immigration enforcement efforts. This is a sorry attempt to push a false agenda at a time when the administration is focused on assisting millions on the East Coast facing a catastrophic disaster. Houlton stated that the funds did not come from disaster relief funding, which is a separate pool of money within FEMA, and therefore could not have been used for hurricane response. Moira Whelan, a former DHS official, told The Washington Post that Houlton was “parsing words,” because money outside the Disaster Relief Fund is still used to prepare for disasters and improve the response to them. “This comment from FEMA’s spokesperson is as factual as the president’s assertion that Administration’s response to Hurricane Maria was ‘incredibly successful’ and ‘one of the best jobs that’s ever been done,’ ” Zaccaro said via email. Meanwhile, immigration advocates are concerned not just about where the money came from, but where it went. “There’s perhaps never been a clearer articulation of this administration’s priorities than this transfer document: cruelty over compassion. While Puerto Rican families struggled to survive a disaster our government largely ignored, the White House and DHS took funds from FEMA’s coffers to jail more asylum seekers and beloved community members,” Heidi Altman, the director of policy for the National Immigrant Justice Center, told NPR via email. The Senate’s appropriations subcommittee on Homeland Security has, less publicly, expressed similar concerns. “The Committee strongly discourages transfer or reprogramming requests to cover ICE’s excesses,” the report stated. Future requests should include “transparent and publically-available evidence” that the money is required because of “circumstances … that are truly beyond ICE’s control,” the senators said. Other DHS operations also saw their budgets cut to cover detention and deportation costs, according to the document released by Merkley. The Coast Guard is losing $14 million it would have spent on maintenance, while the Federal Air Marshals program is being decreased and the Countering Weapons of Mass Destruction office is not getting funds for planning and training materials.